This entry was posted in Giuseppe Ungaretti, new zealand centre for literary translation, Poetry, Poetry Comics, Poetry translation, victoria university wellington, World War One and tagged fratelli, fumetti, fumetto, Italian poetry, marco sonzogni, poesia italiana, ross woods, world war one poetry. Bookmark the permalink. 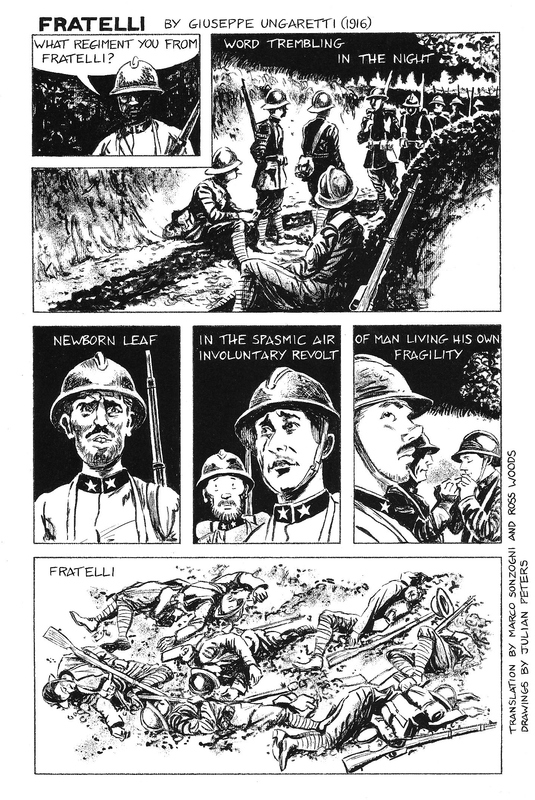 An accurate translation, but I agree with Sonzogni and Woods’s decision not to translate “fratelli.” English-speakers seem less likely to use that word in real life military context, I think, and the opening line is really supposed to echo an actual utterance by a soldier. Regarding the translation of “parola” – given that the first line appears to be a sentry’s challenge, it seems to me that the poet might have meant “password” rather than “word”. But I might be reading too much context into it. I’m loving the poems, by the way! Just curious about the translation of “parola” – it does mean “word”, but I’m pretty sure it also means “password”, and that seems more appropriate in this context (a sentry challenges with “What regiment are you from?”; life or death could depend on giving the correct answer). Loving the poems, by the way. Like all Ungaretti poems, this one is open to multiple interpretations. I think the triple iteration of the word “fratelli” suggests that is the word being referenced, but it could also be the reply to the soldier’s question.